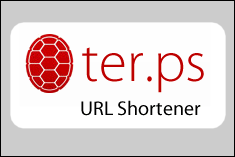 The ter.ps app, a URL shortener created by Engineering IT, is two years old as of this past Friday (10/17/13). It has become very popular and is used campus-wide with growing numbers. 2975 links in the first year. In the last 30 days, 719 links created, close to 25/day. Thanks to everyone for feedback and for making this application a success. To use the application, go to http://ter.ps.